Suriname Special Forces. Photo by Sanoesie101, Wikipedia Commons. 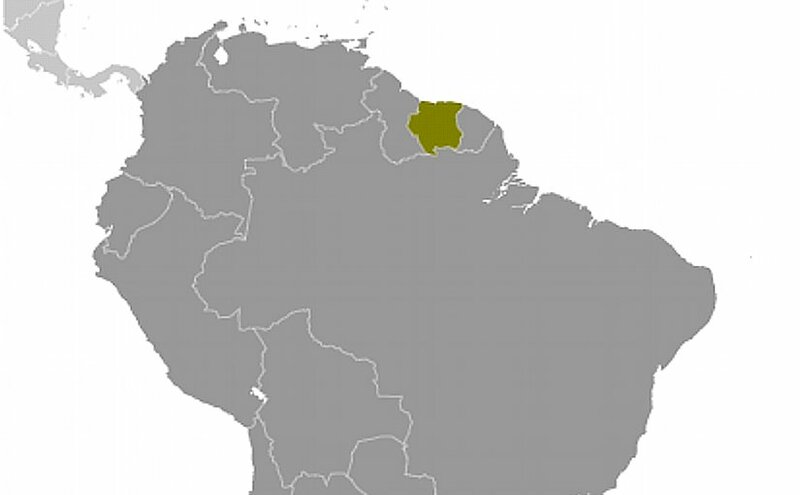 Location of Suriname. Source: CIA World Factbook. In 1980, a group of non-commissioned officers (NCOs) overthrew the elected government despite intense resistance from a badly outgunned police force, which was only subdued when the navy shelled them into submission. This led to the establishment of a de facto military dictatorship (though there was a nominal civilian president) in the country for the next seven years, headed by Sergeant-Major (self-promoted to Lt. Colonel) Desi Delano Bouterse. In December 1982, following a counter-coup attempt earlier in March, 16 prominent Surinamese soldiers, lawyers, academics, businessmen and trade-unionists were murdered allegedly at the behest of Bouterse and his henchmen. As one of the victims was also a Dutch national, all assistance programmes were suspended by the Dutch Government. The trial of the perpetrators of this crime has since been a subject of much controversy in Suriname. Furthermore, thanks to the continuing efforts of Chandrikapersad Santokhi, earlier in his capacity as commissioner of police and thereafter minister of justice and police, and later as the leader of the opposition, Bouterse was finally prosecuted and put on trial for his involvement in the December 1982 murders – leading to Bouterse dubbing Santokhi as the ‘sheriff’.5 This led to Bouterse Government extending amnesty in 2012 to all those who were accused of involvement in the 1982 murders including President Bouterse himself. The amnesty is being challenged in Suriname’s courts and the legal arguments and machinations surrounding the trial continue to be debated to this day, with no sign of closure for the families of the victims. However, rhetoric has not been matched with budgetary allocations. Suriname currently spends about 0.6 to 0.7 per cent of its GDP on defence.11 At a time when its commodity dependent economy is experiencing negative growth rate of two per cent per annum, funding will inevitably be in short supply.12 While defence expenditure may have been high during the period of military dictatorship (reliable figures being unavailable), but that has not been the case 2008 onward. Bouterse has since shown no inclination to increase defence spending. The Dutch assistance has gone to the Suriname police rather than the national army, and the American assistance has been largely in the form of intelligence cooperation with some minor support in the form of small arms and vehicles. In neither case has the assistance been very high. The US security assistance amounted to $422,236 in 2012, 97.3 per cent of which was for general military assistance and remaining three per cent for narcotics control programmes.13 What is of interest is the US effort to train the officer corps of the national army on military’s role in a civilian democracy. It might be suggested that the legacy of the 1980 Bouterse coup still looms large in the consciousness of Suriname’s partners. The Nationaal Leger (NL) or the National Army consists of all the three formations and all use army ranks. The naval unit (or Marine) of the NL, which was reconstituted as the Coast Guard, now reports to the ministry of internal affairs though it remains under military control. It should be noted that most formations are led by Lt. Colonels, with the current commander of the NL, Adolf Jardim, holding the rank of a Colonel. This rank is also held by the Director-General of the Coast Guard. A Military Police Corps (also responsible for immigration). In addition, Suriname has a small artillery detachment comprising three vintage QF 25pdr artillery pieces, though it is not entirely certain whether the guns are functional.16 These assets are augmented by nine DAF YP-408 APCs, dating back to the 1970s, and a number of 14.5mm and quad-12.7mm anti-aircraft guns. A detachment of M40 106mm recoilless guns that was once in service has not been seen for some years now. After spurt in piracy, blamed on neighbouring Guyana, Suriname rebuilt its Coast Guard between 2012 and 2013 with the induction of three French OCEA patrol boats. The serviceability of these vessels is not entirely clear, with some observers suggesting that maintenance is a chronic problem largely due to the fact that these vessels themselves are not particularly robust – OCEA is best known for manufacturing pleasure craft. Despite then Vice President Robert Ameerali saying that the country could be proud of its Coast Guard, the response of Colonel Jerry Slijngaard, who heads government’s Coast Guard Committee, was rather pessimistic. He was of the view that these vessels are barely sufficient to patrol Suriname’s territorial waters and combat maritime crime activities like piracy.18 In fact, since 2013, no new vessels have been acquired nor have any older ones been returned to service. Suriname’s only operational aircraft seem to be the three Chetak helicopters India delivered in 2015.20 While the project suffered from multiple administrative and financial problems, these aircraft continue to operate as the nation’s only military aircraft. They are supported by a single Eurocopter Bk-177B-2, operated on behalf of the Suriname Police Corps. In a belated recognition of the need for a fixed-wing component, a single de Havilland Canada DHC-6 Twin Otter is reportedly on order. It appears that the Surinamese Police has been the biggest recipient of training and assistance from the US and the Netherlands. The Caribbean Basin Security Initiative has yielded significant benefits to the police in terms of training, equipment and technical assistance.23 In comparison, the army has been left to its own devices and any assessment of the armed forces show how lack of maintenance and outright neglect has repeatedly compromised its capabilities. While the national army has to an extent managed to restore a veneer of its former capability, it remains critically deficient in terms of air transport and maritime surveillance aircraft. Its small force of OCEA patrol craft is insufficient to provide adequate coastal surveillance. With such compromised capability, it is an open question whether Suriname’s armed forces will prove equal to the task of combating transnational organised crime. 1. Suriname Census Statistics 2012, Algemeen Bureau voor de Statistiek in Suriname (General Bureau of Statistics in Suriname). 2. In 1994, the author undertook some research into this aspect of Suriname’s armed forces. No data was forthcoming but the author spoke with academics who studied Suriname and then proceeded to examine photographic evidence of armed forces and police parades and exercises. 4. “Dutch Supreme Court rejects bid for review of Desi Bouterse drug sentence”, Stabroek News, January 14, 2015. 5. Stieven Ramdharie, “Moet Bouterse bang zijn voor Chan de Sheriff?”, de Volkskrant, May 21, 2015. 6. “Suriname President’s Son Pleads Guilty to Abetting Hezbollah”, Haaretz, August 30, 2014 and Jonathan Stempel, “Suriname President’s Son Gets 16 Years in U.S. Prison for Aiding Hezbollah”, Haaretz, March 10, 2015. 7. Guy Taylor “Hezbollah moving ‘tons of cocaine’ in Latin America, Europe to finance terror operations”, The Washington Times, June 08, 2016. 9. Marvin Hockstam, “Suriname Defense Ministry Boosts Spending, Cooperation with Pentagon”, Dialogo, May 20, 2013. 11. “Suriname Military Expenditures – Percent of GDP”, IndexMundi, As of May 16, 2008. 12. “Suriname facing economic crisis – report”, Stabroek News, September 24, 2016. 15. Author’s observation during a military parade held on November 25, 2015. 16. Ibid. Also during the second parade in 2016. 18. Ray Chickrie, “Suriname gets modern coast guard to tackle Guyanese pirates”, Caribbean News Now, September 07, 2013 (accessed January 22, 2017). 20. “India Gives 3 Chetak Helicopters to Suriname”, Defence-Aerospace.com, March 16, 2015 (accessed January 22, 2017). 21. Marcos Ommati, “Suriname Sees Transnational Criminal Networks as Biggest Security Challenge”, Dialogo, August 29, 2016 and Suriname, 2016 International Narcotics Control Strategy Report (INCSR), Bureau of International Narcotics and Law Enforcement Affairs, U.S. Department of State (accessed January 22, 2017). There ate some gross errors in this article. The suriname armed forces by law consist of 3 branches army, navy, airforce and 2 independent units namely the military police and the reserves. Furthermorevitvis not true that thecnavy has become the coast guard. The navy still exists as a branch of the armed forces. The coast guards falls directly under the ministry of internal affairs and is a new entity which has nothing to do with the armed forces.